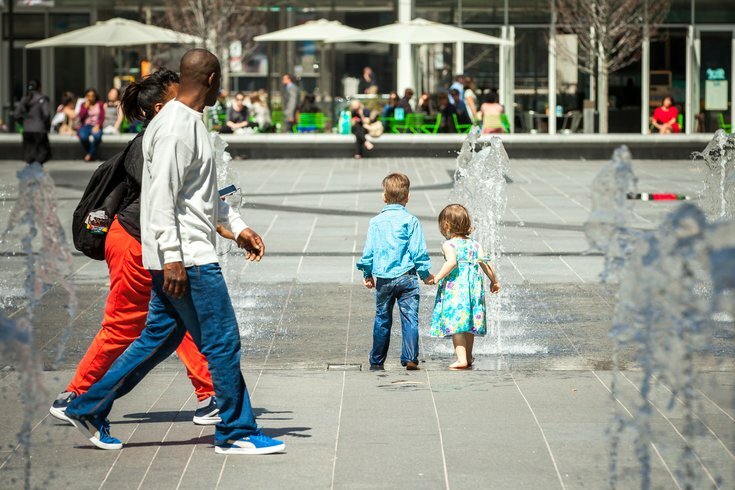 Dilworth Park in Center City comes alive when the weather warms up. Here, Leo and Zoe play in the park's fountains. A chilly weekend in Philadelphia will be followed with spring-like temperatures in the middle of the coming week, according to forecasters. According to the National Weather Service, temperatures will hover around freezing Sunday night and a bit of snow could fall overnight. Things are expected to warm up around Monday with a high around 57, but the real treat comes the next two days when temperatures are set to jump nearly 20 degrees. A high of 70 is predicted for Tuesday and a high of 74 is predicted for Wednesday. Sunday: A slight chance of snow showers before 9 a.m., then a slight chance of rain showers between 9 a.m. and 11 a.m. Cloudy, then gradually becoming mostly sunny, with a high near 45. Calm wind becoming north around 6 mph in the morning. Chance of precipitation is 20 percent. Sunday Night: Partly cloudy, with a low around 31. Light south wind. Monday: Mostly sunny, with a high near 57. Southwest wind 5 to 13 mph. Tuesday: Mostly sunny, with a high near 70. Wednesday: Mostly sunny, with a high near 74. Thursday: A chance of showers. Mostly cloudy, with a high near 66. Chance of precipitation is 40 percent. Thursday Night: A chance of showers. Mostly cloudy, with a low around 49. Chance of precipitation is 40 percent. Friday: A chance of showers. Partly sunny, with a high near 62. Chance of precipitation is 30 percent.